Four Japanese whaling vessels left a port in northeastern Japan on Thursday to conduct what the government calls a scientific research program for the last time before the country leaves the International Whaling Commission at the end of June. The ships, which left Ayukawa port in Miyagi Prefecture, will join four other vessels from different areas of Japan on the mission to catch up to 80 minke whales in April and May off Miyagi and Aomori prefectures to gather data on the whale population and their approximate ages among other information. They will also look into the animals' stomach contents with a view to better management of marine resources. The data will be used as reference for commercial whaling which Japan plans to resume in its exclusive economic zone for the first time in 31 years in July after leaving the IWC. "Scientific data collected during past missions support today's whale hunts. 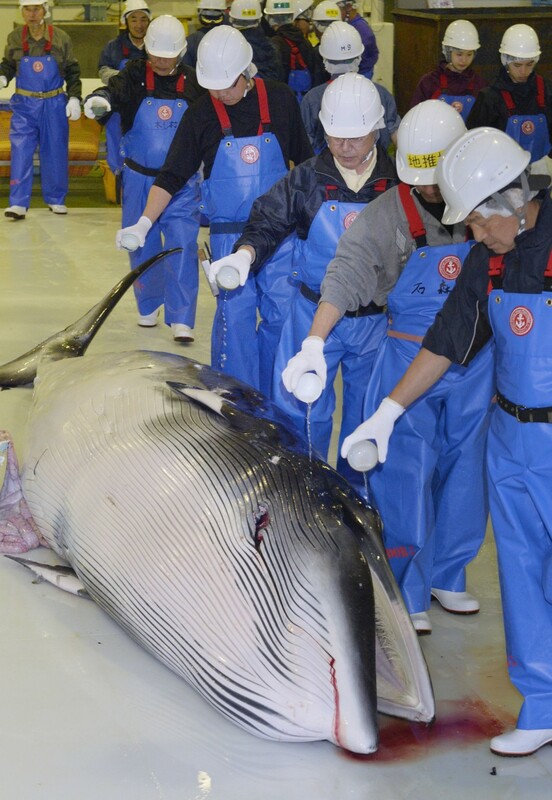 We'll make efforts to sustainably conduct commercial whaling," Shigeki Takaya, head of the Fisheries Agency's whaling affairs office, said at a ceremony to mark the ships' departure, attended by some 100 crew members and whale meat cutters. The mission organized by the Association for Community-Based Whaling in Fukuoka involves vessels from the town of Taiji in Wakayama Prefecture, known for its whaling and dolphin-hunting culture, and the city of Minamiboso in Chiba Prefecture. After whale hunts planned off Miyagi and Aomori, the vessels will move to the sea off northern Japan's Hokkaido to engage in commercial whaling. Although Japan halted commercial whaling in 1988 in line with a moratorium adopted in 1982 by the IWC, the country has hunted whales for what it claims to be scientific research since 1987, a practice criticized internationally as a cover for commercial whaling. Tokyo notified the IWC of its pullout in December after its proposal to resume commercial whaling and change decision-making rules at the body was rejected at its annual meeting in September amid a long-standing rift between pro- and anti-whaling nations.